Is there a physical limit to how much irony one person can absorb? Does it accumulate in your thyroid like radiation? John McCain (R – Predator), arrived in the rebel stronghold of Benghazi on Friday morning. Several demonstrators waved American flags as a crowd of about 100 Libyans greeted the Arizona lawmaker. 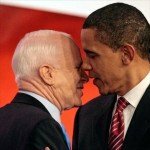 Some chanted, “Thank you John McCain! Thank you Obama! Thank you America! We need freedom! Gadhafi go away!” as McCain visited the city’s Freedom Square. “Let’s be honest: Our objective in Libya is regime change,” said McCain. This is the same McCain who in 2009 led a delegation of US senators to meet with Gaddafi to discuss the possible delivery of non-lethal defense equipment. The visit and Washington’s offer of military equipment was seen as another sign of the improving ties between the former longtime adversaries. “We discussed the possibility of moving ahead with the provision of non-lethal defense equipment to the government of Libya,” McCain said at a news conference. Reaching a tad deeper into the irony hat, we find on April 1, 2007, the same McCain strolled through the open-air Shorja market in Baghdad in an effort to prove that Americans are “not getting the full picture” of what’s going on in Iraq. In a press conference after his Baghdad tour, McCain told a reporter that his visit to the market was proof that people could “walk freely” in parts of Baghdad. Better yet, following McCain’s market walk, then Presidential candidate Hope Obama said “”Progress in Iraq cannot be measured by the same ideological fantasies that got us into this war,” again calling for a phased withdrawal to begin May 1, 2007, and be complete by March 31, 2008. A year after the McCain market walk, the area was taken over by Moqtada al Sadr’s Mahdi army. Obama was elected president of change. A few years after that, the troops are still in Iraq as the US begs to let them stay past 2011 and presto! we’re at war in Libya with McCain on the ground again calling for more blood. Also, please note in 2007 when McCain was in Iraq, the US and Libya were reaffirming friendly relations after having restored diplomatic recognition and reopened our Embassy.